With Sydney being closer to Asia than it is my homeland (the UK), one might expect to come across more Japanese music in the op shops. But this one, despite being by a Japanese artist, is actually a UK pressing. Masami Tsuchiya was the frontman of Japanese new wave band Ippu-Do who had a small amount of interest in the UK in the early 80s. How small? Well, as of the time of writing, they don’t even have their own Wikipedia page. Thirty years ago Tsuchiya was best known to me and my friends as the guy who played guitar on tour with Japan after Rob Dean left (he can be heard on the live album Oil On Canvas (1983)). He later went on to play alongside David Gilmour and Carlos Alomar on Arcadia’s So Red The Rose (1985). 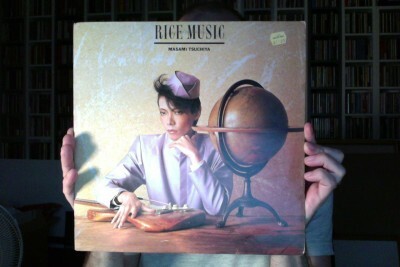 Rice Music was his first solo album and should be of interest to fans of that late 70s / early 80s intersection of Western and Asian pop styles; synths and guitars; and the kind of new wave branded New Romantic. While Tsuchiya is a talented multi-instrumentalist, for this album he also enlisted a who’s who of sympathetic musicians of the era: Bill Nelson (who supplies “flying e-bow” guitar) , Ryuichi Sakamoto, Steve Jansen and Mick Karn of Japan, Percy Jones (along with Karn, the other notable fretless bass player of the period), Toshio Nakanashi (of seminal Japanese new wave band Plastics). Musically it ranges from territory similar to late-period Japan as on the closing ‘Night In The Park’ to the more experimental likes of ‘Haina-Haila’. While my current favourite is ‘Kafka’, the track that features Sakamoto. A proto-industrial, scratchy funk number with a bassline that recalls the tuned down guitar of The White Stripes ‘Seven Nation Army’. This entry was posted in Adventures in Op Shops, Vinyl and tagged 80s, Op Shop, Pop, Vinyl by nickpeters. Bookmark the permalink.